Having a tournament outside in the Northeast United States in January is always a crap shoot when it comes to the weather. With the name "Ice Breaker" in the title, one would expect below freezing temperatures and a lot of snow and ice on the ground, but this weekend proved a bit different. Temperatures soared into the 40s and 50s(F) and provided an excellent stage for the 20 players to take their shot at the top of the leaderboard. The Ice Breaker Tournament has it roots back in the 2009 inaugural tournament organized by Gary Shiff at the Knoles'N'Holes course in Bozrah, CT. That course customarily held a fall tournament and the winter edition did see some ice on the holes as well as variety in styles of play, including being able to use hockey sticks as putters. The tournament has been on hiatus for a few years and came back strong this year under organizer Elmer Lawson. 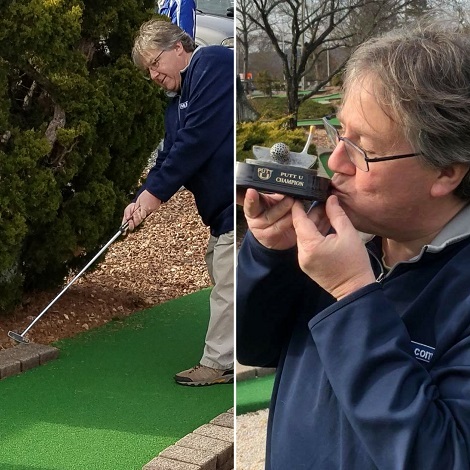 The 2018 edition was played on the Putt U course in Center Valley, PA, which is a difficult and long course, and home of the 2016 U.S. Open. It was a two round tournament, one round played on each the red and blue courses. The tournament saw a mix of local and USPMGA players and it was no surprise that the podium scores were close, separated by one stroke each. In a fun bit of the universe smiling, Gary Shiff would win the reincarnation of the tournament, shooting a 92 for the two rounds. Despite the difference in the courses, he shot a 46 on both with the same number of 2s, 3s and a five. He would be closely followed by fellow USPMGA minigolfer Elmer Lawson with a 93 and Ken Bowley, former winner of the annual course tournament, would take 3rd with a 94. Elmer would charge back from a 50 and give Gary a run with a 43 during the second round but fell just short of taking the top spot. That score would also prove to be the low round of the day. Tournament organizer Elmer Lawson had this to say about the event, "It was a great turnout. Everyone had fun. I do believe we can make it an annual event." We also caught up with Gary Shiff after the event. "I haven't played much these last 12 years as I had from 1995-2005, so I was just hoping to be competitive enough and whatever happens, happens. It was also great playing with Elmer Lawson again. I have so many fond memories of our tournaments throughout the Northeast, as well as playing on a few Team USA's. Since each course is very long, I was a bit concerned that only 1 hour of practice would not be enough, but the course played pretty much the same as I remembered it from the last time I played there (2016 US Open) and I was able to dig up my old course notes and make a PDF to look at on my cellphone. The courses were both in great shape and we lucked out with the weather as the temps nearly reached 50 degrees (10 Celsius)."